Built in the 12th Century by King Jayavarman V11, this Banteay (meaning fortress) is located 140km North East of Battambang. While Angkor Wat receives an average of 7000 visitors a day, Banteay Chhmar attracts less than 6 visitors as a daily average. Affording a retro prospect to explore the ruinous site without being disturbed by hoards of tour groups with bullhorn wielding tour guides. Best reached by motorbike along a potholed road from Sisophon. A conservation project is currently working at the site. The following is from Cambodia Less Travelled by Ray Zepp, first published in 1998. Now that Highway 69 north of Sisophon has been improved, the great temple at Banteay Chhmar is now much more accessible than it was a year ago, and many more tourists are taking advantage of the improved situation. 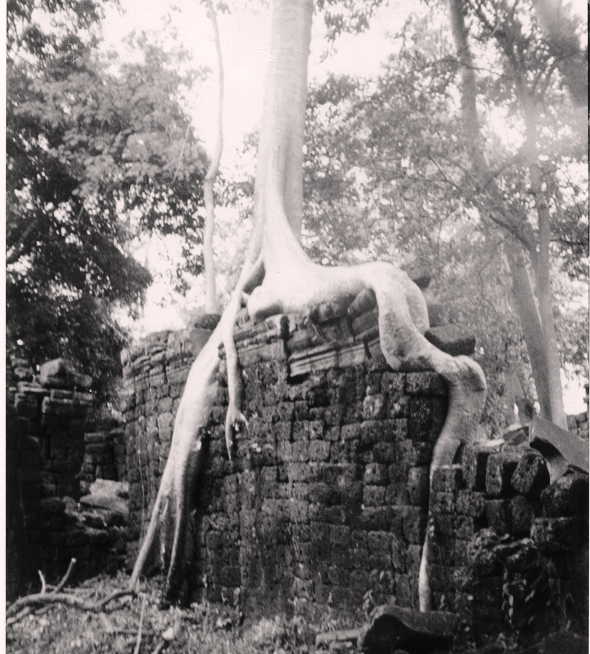 I tried to visit Banteay Chhmar in November 1997, but made it only as far as Thmar Puok. Right at the large signboard where the road turns off to Boeung Trakoeun the road north was blocked and there were two large tanks warning that the Banteay Chhmar area was currently a battleground. 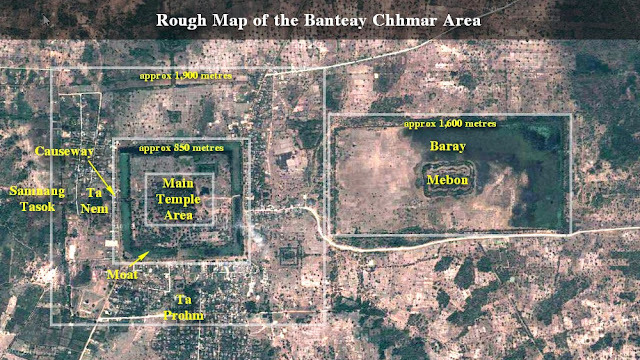 Indeed, Banteay Chhmar has been in the center of a war zone for the past 20 years and has suffered accordingly. There is a small book by former guerilla leader Son Sann that describes his elation at recapturing Banteay Chhmar from the Vietnamese back in the 80’s. You could see how important this large piece of Khmer culture was to the Cambodians. In fact, back in 1901 Etienne Aymonier, in his recently translated book, Khmer Heritage in the Old Siamese Provinces of Cambodia, declared Banteay Chhmar to be among the top three temples in Cambodia, right up there with Angkor Wat and Angkor Thom. I spoke with several former Site II residents (i.e. the 1980s border refugee camp not far from Banteay Chhmar), and they told me that the devastation of Banteay Chhmar in the past 20 years has been horrible. An article in the National Geographic Magazine a couple of years ago painted a picture of rampant looting of the statues and carvings, and this description was backed up for me by personal accounts of witnessing stone carvings blatantly labeled Banteay Chhmar in the Bangkok art shops. A colleague who had visited the temple only a year or so ago told me to look for the Brahma carving with many arms, but we both agreed that it would probably have been looted by now. So I did not have very high expectations of finding anything left. I was pleasantly surprised. Almost all the wall friezes described by Aymonier are still there. As we climbed over the rubble to the far side (actually the front gate, as HIndu temples face west), I kept hearing the children accompanying us saying “samsup pii, samsup pii” or “thirty-two, thirty-two”. When we emerged from the main gate, I saw that they were referring to the 32 arms of the Brahma frieze, still intact and in good condition. There was at least one other Brahma carving, this one with fewer arms. But Aymonier had described ‘a god with 32 arms; another with six arms; a third with six arms; a fourth with eight arms…, a fifth with eight arms; a sixth with four arms, and a seventh with sixteen arms.” We were unable to find most of these, and so we assume they have been looted and sold. 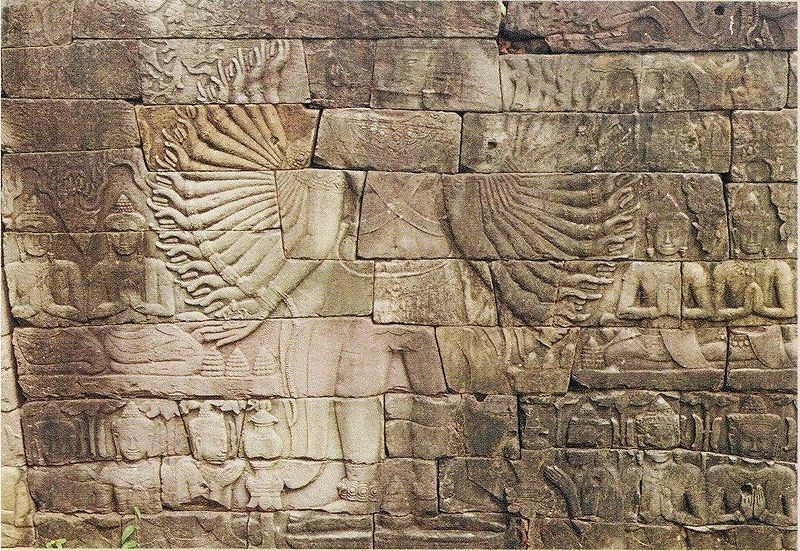 Several people have told me that the 32-armed god, or perhaps one of the lesser-armed gods, was stolen a few years ago, but that the truck taking it to Thailand was stopped, the artifacts discovered, and the stones returned to Banteay Chhmar. I cannot verify this story, but the fact that I hear it from several sources indicates that it may be true. Beyond the main western entrance is a large area that used to be the huge Baray, or reservoir, similar to the one at the Angkor complex. There used to be a temple in the middle of the baray, but it is now in ruins and hardly worth the visit. Besides, the now empty baray is outside the shady area and can be very hot. If you want shade for a relaxing drink, you can sit in front of the eastern entry point and drink a coconut under the big trees by the village market, while gazing at the large stone guardians of the gate. Only on the west wall of the temple are there depictions of gods; the other three sides have only scenes of royalty, or of processions of soldiers, or of ferocious battles. One shows an oxcart being swallowed by a monster. Others show war elephants, gong players, war canoes, and the ark of the sacred fire. On the whole, these friezes on the other walls appear to be in good condition. They are really worth the price of admission --still free of charge. In fact, Aymonier considers these carvings to be better than those at Angkor Wat: “..the women in its low reliefs less insipid and better drawn than the nymphs of Angkor Wat.” I was particularly impressed with the hunting scenes with bow-and-arrow on the east wall to the left of your first entry point. I do not wish to dwell on the history and description of the temple. All that can be found in great detail in Aymonier’s book. To whet your appetite, here are a few facts culled from Aymonier and from Moura, another early French explorer. Aymonier believes the temple to be slightly older than Angkor Wat. Its large Bayon towers, similar to those of Angkor Thom, suggest that the two were roughly contemporary, but the fact that this is primarily a Hindu temple, while Angkor Thom was a Buddhist temple dedicated to the Hindu god Brahma, indicates that Banteay Chhmar is the earlier of the two. 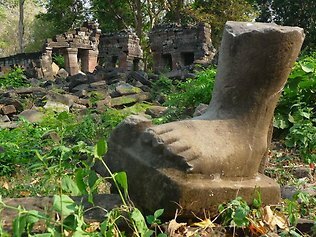 Despite the large Bayon towers of the four-faced Brahma, Moura thinks that Banteay Chhmar was a Vishnu temple. His main evidence for this conclusion was the existence of many statues of garudas, the magic bird symbolic of Vishnu. Many-armed gods such as those shown on the western wall could represent any number of gods, but in Cambodia, many-armed gods are likely to be Vishnu, known as Preah Nireay. Aymonier entertains the possibility that Banteay Chhmar, like Angkor Thom, was a syncretic mixture of Hinduism and Buddhism. Finally, Aymonier, obsessed as ever with inscriptions, sees in the square style of the letters a clear resemblance to the writing on the Bayon in Siem Reap, and he concludes, “The square letters, with well-detached curls, clearly indicate the twelfth century.” But the inscriptions tell stories of the reign of Yas’ovarman. As a result, Aymonier believes that although the inscriptions were added in the twelfth century, some parts of the temple must have existed as early as the ninth century. But you can find histories and theories in many books, and so I need not dwell on such topics. What I do wish to describe is the atmosphere of the place. The vast temple complex is situated in a forest of very tall trees. These trees are of the same species and nature as those seen at Ta Prom temple in the Angkor complex, and provide the same romantic atmosphere as Ta Prom of the roots and trees of the jungle overcoming the ancient temples. Indeed, without the hordes of tourists, the jungle setting may be even more romantic than that of Ta Prom. The tall trees form an acoustic canopy that echoes the birdcalls back to the listener. For this reason, I recommend going to see the temple as early as possible in the morning to catch that magic jungle stillness of the sleeping temples. So I recommend staying overnight in Thmar Puok at the Ly Hour Guesthouse, perhaps going out to the Banteay Torp temple a few kilometers away for sunset, and then the next morning arriving by sunrise at Banteay Chhmar only 15 kilometers away. 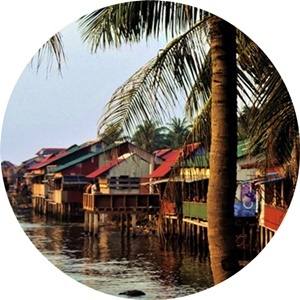 You can do the trip in a day from Sisophon, only an hour or so away, or even from Battambang, about three hours away. But why rush and spend so much of the day on the hot, dusty road? It is better to relax in the quiet town of Thmar Puok, visit another minor temple or two at sunset, and be fresh for viewing Banteay Chhmar in the beauty of the early morning. It may be that the improvement of Highway 69 will save Banteay Chhmar. With many more visitors and outside recognition, looters will find it more difficult to raid the place, at least in broad daylight. I can only hope that the local people, seeing the temple as a boon to their development in terms of souvenirs, snacks, and perhaps future guesthouses, will understand that the temple is worth more to them as it stands, rather than dismantled and sold in pieces to Thailand. On the other hand, the large numbers of tourists and picnickers may just destroy the place if they continue to climb over the walls and deface the carvings. My Khmer colleagues were outraged to see adult Cambodians writing their names on the 32-armed god and on other wall carvings. I would suggest that someone make a comprehension collection of rubbings of the bas reliefs in order to preserve them for posterity. Such rubbings could be a source of tourist souvenir income and could help to convince the local people that these ruins are worth preserving. In summary, to be fair, Banteay Chhmar cannot really compare with Angkor Wat. It is in quite poor condition. Most of its walls and towers have been reduced to piles of rubble. But on the remaining towers you can still pick out the huge Bayon faces, and the outer walls still have most of the scenes described by Aymonier. The best feature of Banteay Chhmar is its jungle atmosphere. If you liked Ta Prohm in Siem Reap, you will love Banteay Chhmar and its romantic forest setting. The title has a double meaning. 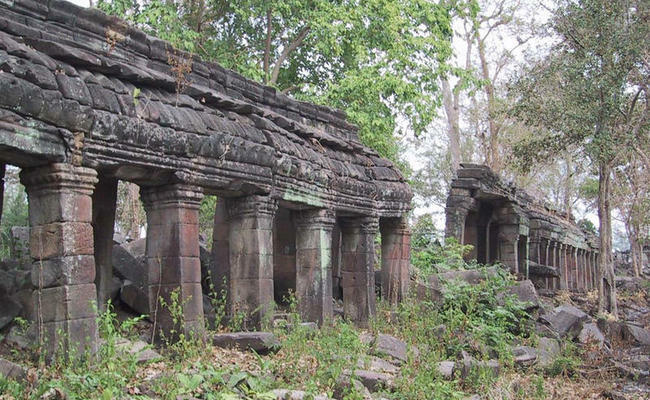 The temples north of Banteay Chmar have been lost to Western eyes for nearly a century, but they have been physically lost as well – utterly destroyed by looters. In many cases, temples that the Frenchman Etienne Aymonier found before 1901 and described as beautiful have now been stripped of anything of value so that only a few laterite blocks remain. Even the stones themselves have been carted off to be used as foundation stones for houses. That said, the search for these lost temples is a fascinating activity. There is always the hope that something more than a few stones can be located, and even in the worst cases, the rediscovery of an archaeological site described over a century ago affords a certain amount of pleasure. …a very forested region with only small villages distant one from the other. Several ruins testify that it was clearly much more prosperous at the time when a great city, probably a capital, rose up at Banteai Chhmar. 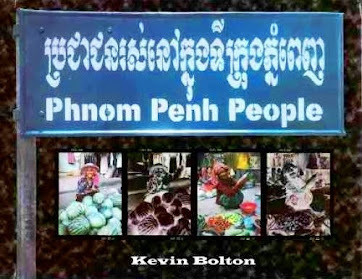 Kouk Mon is the only village of any size on the road between Samraong and Banteay Chmar. Aymonier mentions Kouk Mon as having ‘some forty huts’ and being the location of several temples, notably Prasat Sing, Prasat Kuk, and Prasat Top. We arrived in the village from the Samraong side and asked if there were temples near the town. The villagers gave us directions to the west and then to the north along a good road that turns right next to a school building. Less than a kilometer along the road is a wat, where we asked again and were told by an old woman to continue north and then to turn left. But when we arrived at the turnoff and asked again, the people living there told us to continue straight instead of turning left. We did so and almost immediately arrived at the temple site, easily spotted because of its location beside a large ancient reservoir covered with lotus flowers. The villagers called the temple Prasat Kanie, a name not found in Aymonier’s book. a brick tower, built on a rather high rampart and presently very much in ruins. Surrounded by its basin-moat, it was preceded in the east by a large, rectangular surface of water. The villagers said that there was no other temple in the area, although Aymonier describes Prasat Kuk as lying only ‘a few hundred metres from there’ . I believe, in retrospect, that the old woman who told us to turn left was in fact directing us to Prasat Kuk, which may have still existed in her younger days but which by now has disappeared. On the other hand, the villagers were well aware of the existence of Prasat Sing, described in detail by Aymonier and still going by its old name, although it is pronounced more like ‘Soeng’ by the locals. You can see the the remains of Prasat Sing from the main highway a kilometer or so west of Kouk Mon. It is situated on a small island in a large reservoir. The only visible sign is the doorway to the temple. The family living in front of the reservoir said that the only way to reach the island was to wade across some 100 meters of the reservoir. They pointed out a path through the mud and swamp by which we needed only wade up to our knees. With the temple clearly in sight, I could hardly abandon the hunt and so launched out into the swamp. We were told to head off to the left first, where the water was less deep. That direction would correspond to Aymonier’s map with the tower to the left and the passageway westward into the main temple. Indeed, we emerged from the muck for a few meters upon reaching the former location of the eastern tower, where a few carved stones still remain. As for the main section of the temple, all that stands is the door, behind which is a large excavation into a brick foundation. It was in ruins even in 1901. The reservoir, on the other hand, has remained intact for over a thousand years, as described by Aymonier as about 240 meters E-W by 120 meters N-S and “surrounded by strong levees with earth from the excavation.” The basin is a pleasant sight and is the home to wild ducks, jacanas, herons, and other waterfowl. I had been told that there was now a guesthouse in Banteay Chmar, but unfortunately this was not the case. However, a local former teacher named Sec Saroet speaks some English and let me put up for the night in a very comfortable house behind the market area. In fact, Mr. Saroet proved very knowledgeable about local ruins and agreed to take me north towards the Thai border. My initial target was Kedol Village as shown on Aymonier’s map. 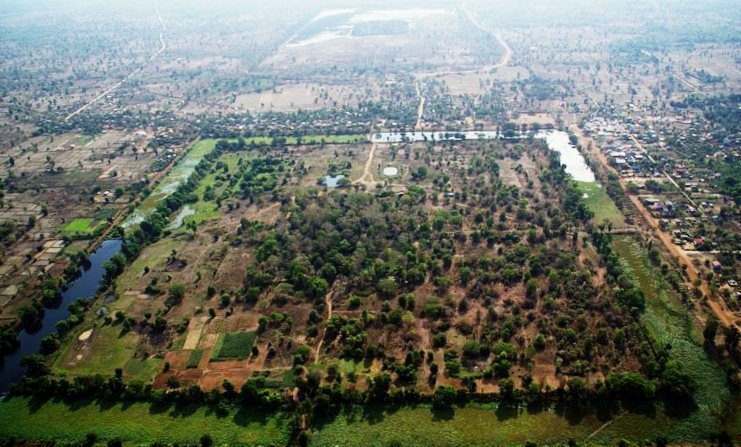 Indeed, the pleasant village still exists by that name, and is located about three km east of the Banteay Ampil road. At the rear of the village is the temple, situated typically on a rise in a large basin. There was almost nothing left of the temple, only a couple of cornerstones and sections of a laterite wall. We asked a group of schoolboys whether there were any other nearby temples, and they answered in the affirmative. 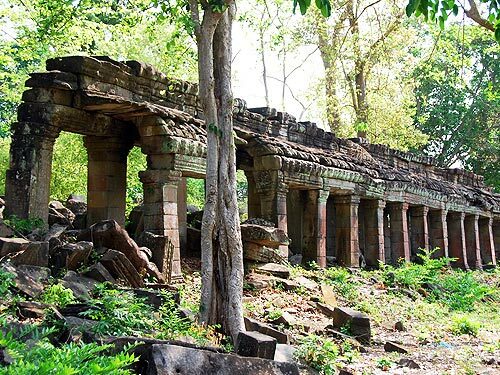 However, they said that other ruins, although in better condition than Prasat Kedol, were far away in the forest, where they were afraid to go. After a long discussion, we persuaded one of the boys to accompany us into the forest to find the temple. The oxcart track was very sandy and dangerous for three people on a motorcycle, so I ended up walking for much of the 3 km trek. The young boy took us right to the temple site, again easily spotted because of its large basin of lotus swamp. From the sandy track it is still a difficult scramble through the weeds and thorns to reach the small hillock on which stands the temple. There remain in fact two small towers, only a meter or so in height, and made of brick. We had difficulty understanding the boy’s pronunciation of the temple’s name, but it sounded like Tu Ey. Because of the double tower, Prasat Tu Ey does not appear to correspond to Aymonier’s Prasat Chanlatdai, “a single tower surrounded by its moat-basin, preceded by the great water surface and built in bricks.” So I cannot be certain whether we ever found Prasat Chanlatdai or not. From Kedol Village, we took a shortcut back to the main road and emerged beyond Ampil. By chance, my guide mentioned that the next village on the road was called Pong Toeuk. That is precisely the name of a temple mentioned by Aymonier, but which I thought was much farther away. So off we went to Pong Toeuk village, where our search was rewarded by a lovely setting of a wat on raised ground surrounded by a small moat. This was the site of Prasat Pong Toeuk, although not much remains of the original temple. There are a few dozen carved stones lying around. A wooden shrine has been built around the door frame of the old temple. The main vihear of the wat has a couple of old carved stones as an altar below the main Buddha statue. Aymonier described three towers at Pong Toeuk, the middle one of which was “in a good state of preservation”. . The residents of Pong Toeuk now call the temple Prasat Koh Keo. A century later, alas, there is no sign of towersBut the clear water of the moat was very picturesque in the late afternoon sun, and I was happy to have made the effort to go to Pong Toeuk. On the return journey, this time passing by Banteay Ampil, now capital of a recently created District in Oddar Meanchey Province. My guide said he thought there was a temple in Banteay Ampil, so we asked at the wat for directions. In fact, there is a temple site, but rather far from the wat. As usual, there is an island of raised earth scooped out of a moat-basin. There are a few stones, but all that remains of the structure is, typically, a couple of door frames sticking out of the thick bushes. 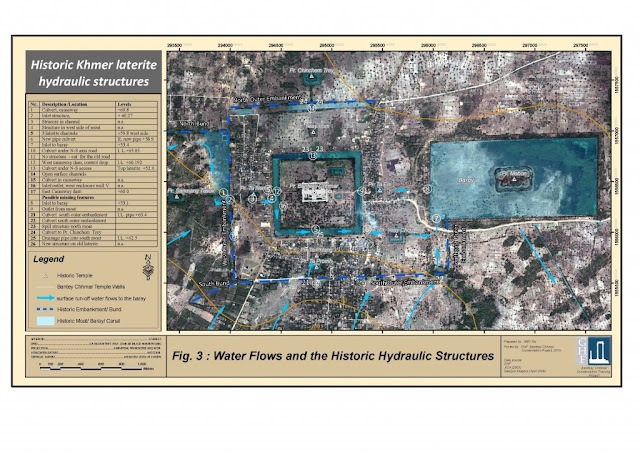 This may be the Prasat Loboek Ampil described by Aymonier as “three small, quite well-preserved towers, having lost only their top, surrounded by their basin-moat.” There may have been three towers once, but there is nothing to indicate such a structure now. On the way back to Banteay Chmar, near the village of Daun Tea, I spotted a typical hillock surrounded by a basin-moat, and noticed a few small spirit-house shrines with offerings. This was obviously a temple site, so I decided to have a look. Indeed, it was an uncharted ruin, although only a few isolated stones remain. It is interesting that all over Cambodia, villagers continue to revere their old temple sites as sacred placed, even though the nothing remains of the original temple. It is difficult to find, but can be identified by a small neak ta shrine at the base of a large tree. I asked the villagers for the name of the site, but they just call it Prasat Saman Tea. But in fact, they added, there is another Prasat Daun Tea just a couple of kilometers to the west. Some adolescents offered to take me there, and so we rode through the deep sand of an oxcart trail for a couple of kilometers to a temple site on a small rise in a field. This second Prasat Saman Tea was once a brick tower, and is now just an excavated hole filled with bricks. As usual, a sandstone doorway is still standing. The surrounding field does not appear to be a reservoir, but there may have been a small moat at one time. Back in Banteay Chhmar village, I spent a comfortable night in the former teacher’s house. This proved to be a good idea, because I was able to visit the Banteay Chhmar temple both at sunset and at sunrise. Most visitors have to travel by car and arrive around mid-day. But sunset and sunrise are the best times to catch the magic atmosphere of the place, especially because you have the entire peaceful place to yourself. So in all, I was able to locate temple sites at Prasat Phnom Kedol, Prasat Pong Toeuk, Prasat Ampil, Prasat Tu Ey, and Prasats Saman Tea I and II. My guide told me that a very beautiful temple remains on the mountain of Phnom Ta Moeun. This is apparently very near the former Site B refugee camp, where my guide had spent several years. He said the residents of the camp were all familiar with Prasat Ta Moeun and sometimes went there to pray. But the site in the Dangrek mountains is now difficult to reach, and that border area is still heavily mined, so I decided not to attempt a search for Prasat Ta Moeun. Thus, of the six sites I visited, no temple has been left standing, and in most cases there are only a few scattered stones and some neak ta shrines erected by the local villagers. These shrines reminded me of gravestones, as they bear the message that here was a site of high Khmer culture that has now passed away.